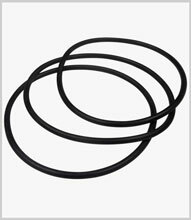 Ubiquitous for their excellent sealing qualities, “O” rings come in a wide range of materials to suit arduous applications sometimes involving moving parts – e.g. hydraulic systems. Common materials include natural rubber, EPDM, Viton®, Silicone, Chloroprene (Neoprene) and many others.